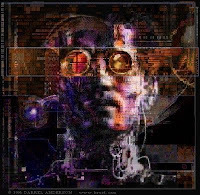 It was twenty-five years ago this week, on July 1st 1984, that William Gibson's now-classic science-fiction novel Neuromancer was first published. The book presented a world overwhelmed by too much technology, a people with a gluttony for body enhancement and personal media, and transnational corporations with the power of major governments. In other words: a time not very unlike our own. Neuromancer is often hailed as foreseeing the rise of the World Wide Web, and it even added a new word to the English language: "cyberspace". In many ways Neuromancer was considerably prophetic, while in others it has missed the mark (so far). On the anniversary of its release, pcworld.com's Mark Sullivan examines Neuromancer after the rise of the near-future fog and details how it got many things right and failed on a few concepts. It's a pretty good article, and especially recommended for any students of cyberpunk fiction. This is one of those books that I need to read, along with "The Rise and Fall of the Roman Empire" and everything by Issac Asimov. I'll get on it after Dune... which I just started, so it will be a while.